Lemonade, chlorine, and simple summer dresses, all the things that remind me of summertime as a girl. The Darling Daisy dress by Sew Like My Mom is one of those casual summer dresses that takes me back to when I didn’t have a care in the world, where the twirl of my dress was something of importance, and whether or not I could comfortably fit my swimsuit underneath it! I must be honest folks, when I saw all of the line drawings for this dress (there are 5), I couldn’t picture how cute each one would be (I actually thought how different could each version look? ), but then I saw all of the testers’ dresses, and I don’t know which one I like best! 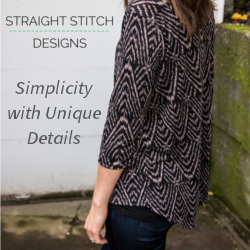 This pattern really lets you mix and match fabrics, and they all look so sweet and lovely. On that note, I had to break out my Cotton + Steel Mustangs by Melody Miller for this one. 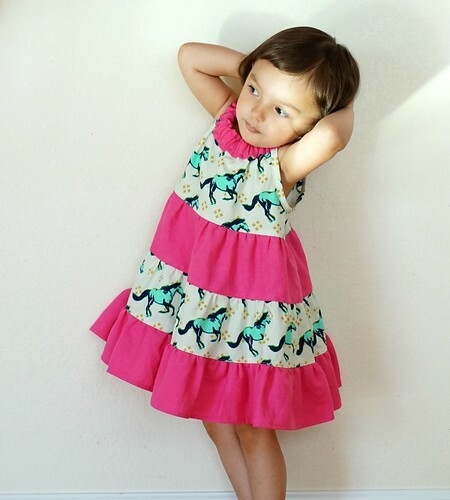 I selected version C (actually, my 2-year-old selected version C) in a size 2, and I paired my mustang fabric with some hot pink cotton linen. Now I won’t lie, the gathers, oh my the gathers, but really worth it (pay attention to how many pieces to cut for each tier!). I’m surprisingly happy with the way this dress turned out! It’s actually one of my favorites now, and people have stopped to comment on how much they like it too. The construction and assembly is very simple, just pay attention to the instructions as she provides lots of detail and description for every step. I made the mistake of mixing up the front and the back when I was attaching the bodice to the first skirt tier, but really, you can’t even tell! The neckline is the only place you might tell, as I closed up the elastic opening at the front (I even opened it up and shortened the elastic, and re-sewed, but you’d never know). 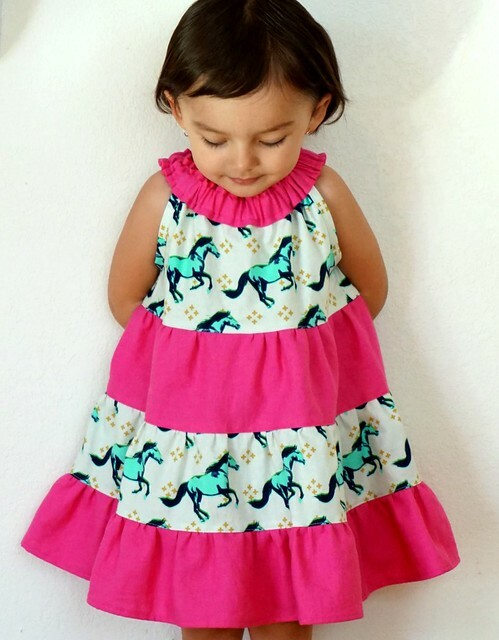 I love this dress, and I have another one in the works for big sissy. She is experiencing extreme jealousy at the moment! 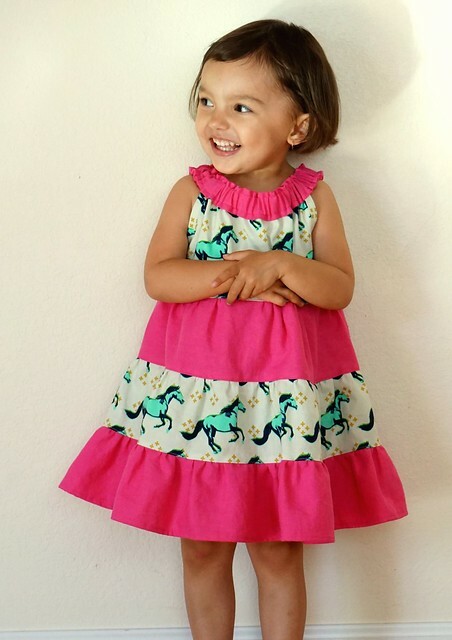 Some details about the Darling Daisy dress pattern: there are 5 versions including a maxi length, available in two size selections, 3 mos-8 years and 9-16 years. It’s actually a NEW updated version of her previous Darling Daisy dress pattern, all done-up in the style of her current patterns. This dress really will not disappoint! In other happenings, my little ones had their hair trimmed over the weekend. My older one wanted bangs again so she could be matchy with her sister. Well, little sis has been practicing her scissors skills, and decided to make a little change to her bangs (uh hmmm, making them disappear), maybe to look different? Anyway, she’s very proud of her little hairstyle now, which can be seen above in the quite successful combover! What do you think? Awww, thank you! My mom thinks I’m crazy, but I actually let my girls peruse Pinterest for haircut ideas. I figure it empowers them, and hair always grows back!